When it opens in May, Brooklynites gazing up at the new BBG Visitor Center on Washington Avenue will witness a hillside transformed: soft lines of glass and steel covered by a rooftop meadow rustling in the breeze. The green roof is gorgeous, but look down—the newly installed landscape around the Visitor Center is no less innovative and inspiring. As many GreenBridge gardeners know, last year’s Community Garden Alliance outreach featured workshops on creating rain gardens. In fact, planning is under way for a rain garden at El Puente Espiritu Tierra Garden in Williamsburg. Now BBG is launching its own living outdoor classroom to educate and motivate gardeners interested in these water-wise, low-maintenance, and beautiful plant communities. Three highly visible demonstration rain gardens are now being installed adjacent to the Visitor Center: two on the north side, just outside the ticketing area, and one on the south side of the building. It all begins with water and where it flows when it rains. In order to divert rainwater from Brooklyn’s overtaxed storm drains and sewer system, much of the Visitor Center’s pathways will be of permeable crushed stone. Areas paved with concrete will be gently sloped and have grooves scored into the surface to help direct storm water into planted infiltration basins—otherwise known as rain gardens. Structures called rills and weirs will slow down, channel, and distribute the water. Rain gardens aren’t wet or swampy, since water flowing into them doesn’t pool. Instead, layers of permeable soil direct water downward, recharging the natural groundwater system. Plants ideally suited for these conditions withstand dry spells punctuated by periods of heavy rainfall; many of them are native species. So when you visit the new Visitor Center—perhaps during a spring shower!—be sure to relax on a bench made from eco-friendly wood and admire the beautiful native plantings near the Washington Avenue entrance. Some herbaceous plants to look out for are blue stars (Amsonia hubrichtii and A. tabernaemontana ‘Blue Ice’) and the switchgrass cultivar ‘Ruby Ribbons’ (Panicum virgatum). Deciduous trees playing a prominent role include sweet birch (Betula lenta), several black gums (Nyssa sylvatica), and sweet bay (Magnolia virginiana). 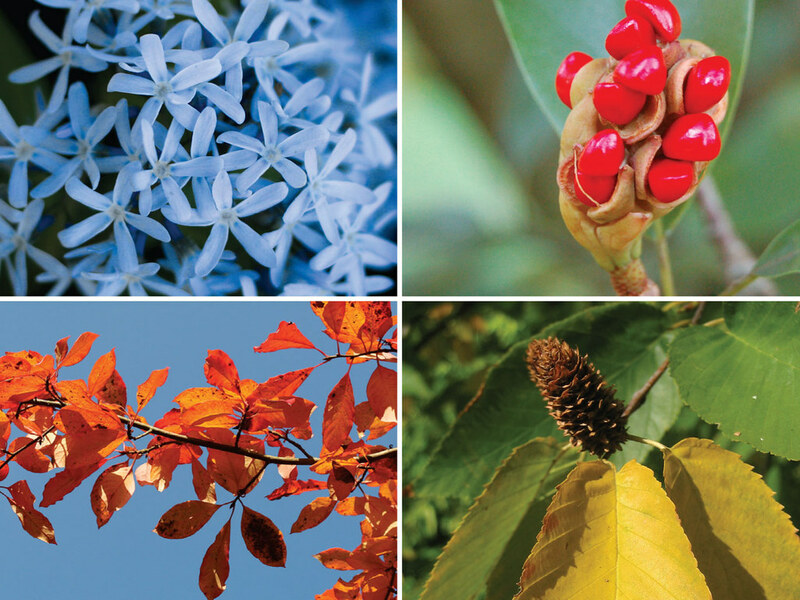 Plants featured in BBG's new Visitor Center landscape include (clockwise from top right) blue star (Amsonia tabernaemontana ‘Blue Ice’), sweet bay (Magnolia virginiana), sweet birch (Betula lenta), and black gum (Nyssa sylvatica).